One of England’s finest tower windmills. 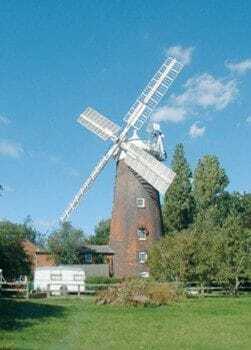 A 6-storey tower mill, built in 1836 by the Wickham Market millwright, John Whitmore. Last worked in 1928, and restored in the 1980s. The sails and cap now turn again, and there is some fine internal machinery, including four pairs of millstones. Ground floor display of history and workings. Open on occasional Sunday afternoons between May and September. For details call 01473 264755 (office hours with answerphone). A donation to charity is sought for your experience.